Some journal play this week in my A4 journal. 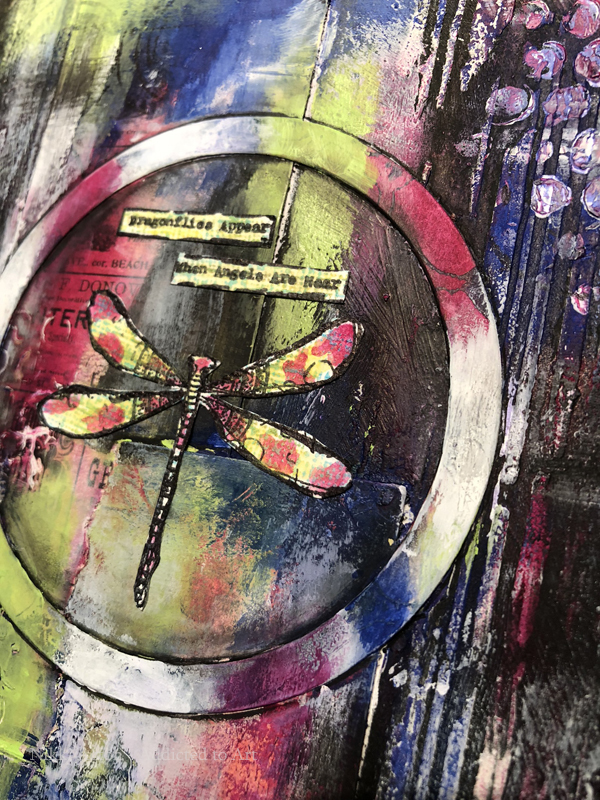 I used Dina Wakley paints and stamps from AALL and Create (Tracy Evans). A little different to the butterfly card I made with the same stamp sets! You can see it here if you missed it. My original journal page was kraft card - but I think it is covered. I stared with random black coverage and white around the edges. 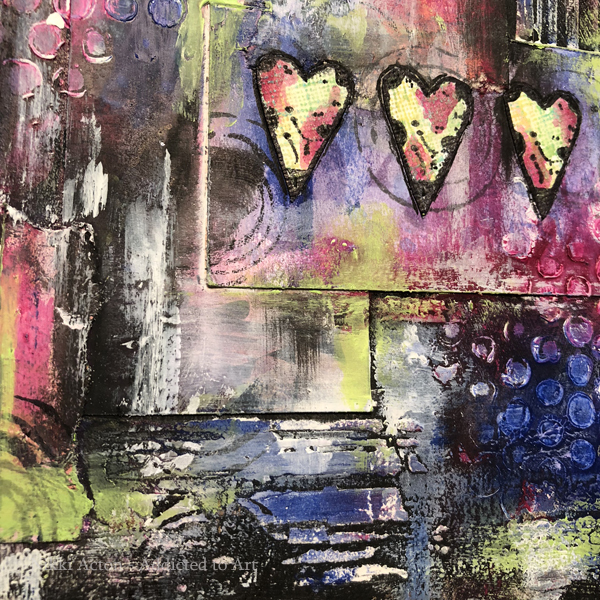 I added some scraps of paper and card and both thick gesso and texture paste through 2 stencils (Tim Holtz dot fade and the stripy one!). I then began building colour - mostly with my fingers. 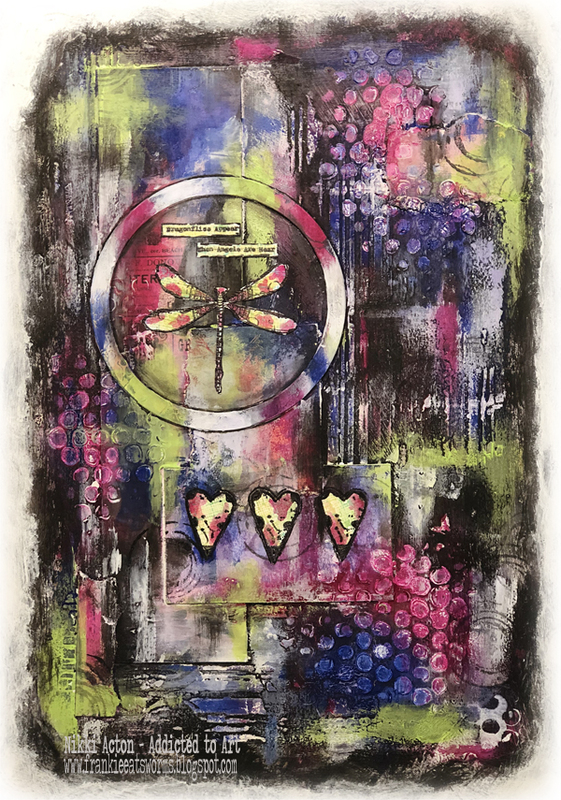 I added random stamping with archival ink from the AAll and Create border stamp set (the random circles) and stamped 3 hearts, the dragonly and words on separate scraps of paper. I added a little colour to these before adding. The circle was a leftover die cut. 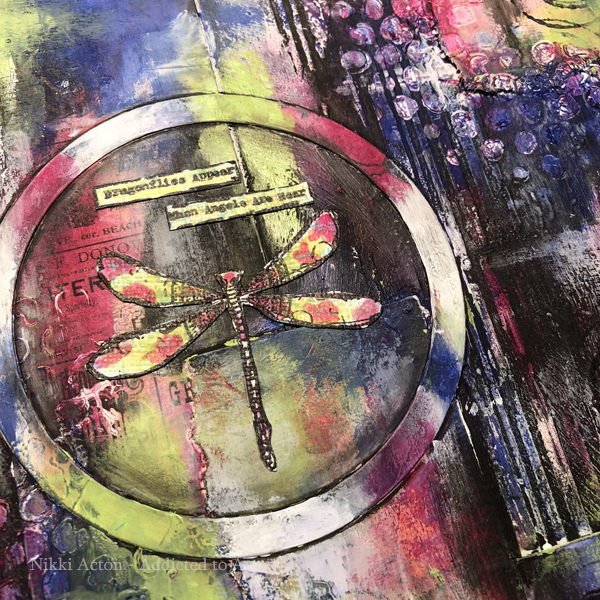 This is an amazing piece of Journaling Nikki love how the darkenss makes those bold colours peek and pop through. Would love to be able to study all those delicious layers of texture. So inspiring, wish I had the time to get messy right now.. Stunning page! I love the combination of colors and that dragonfly is just awesome! Love it! This is spectacular!! I bet it looks amazing in real life!! So many colorful layers. Love these deep rich jewel tones and this awesome design! What an inspiring piece of artwork! Pinned! Hugs! oh my soul!! loving this page.. all the layers and the design.. beautiful! 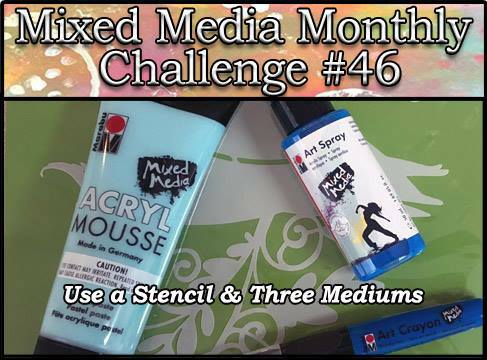 thanks for joining us at the Mixed Media Monthly Challenge page!